Akbar (Abu'l-Fath Jalal ud-din Muhammad Akbar) was a Mughal Emperor from 1556 to 1605. He was a warrior, a carpenter, an inventor and an animal trainer. He is regarded as one of the greatest rulers of the Mughal Dynasty in India. During his reign, he created a library of over 24,000 books written in many languages and the Mughal empire tripled in size and wealth. He has been portrayed by many famous actors in Bollywood. He is known as "Akbar the Great". He had 13 wives and 8 children. 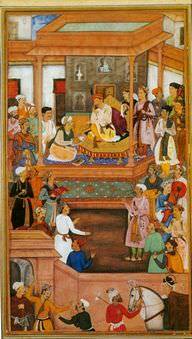 He died of dysentery at the age of 63.
en:Abu'l-Fazl ibn Mubarak presenting Akbarnama to the Grand Mogul Akbar. Mughal miniature. Akbar was a famous Mughal Emperor, who was born on October 14, 1542. As a person born on this date, Akbar is listed in our database as the 6th most popular celebrity for the day (October 14). People born on October 14 fall under the Zodiac sign of Libra, the Scales. Akbar is the 155th most popular Libra. Aside from information specific to Akbar's birthday, Akbar is the 1st most famous Mughal. In general, Akbar ranks as the 1930th most popular famous person, and the 7th most popular emperor / world leader of all time. “The Famous Birthdays” catalogs over 25,000 famous people, everyone from actors to singers to scientists to serial killers and more. If you're curious to see who was born on your birthday, you can use our database to find out who, what, where, when and why. You can search by birthday, birthplace, claim to fame or any other information by typing in the search box, or simply browse our site by selecting the month, the day, the horoscope, or any other clickable option.